What Do We Want? Lots of Stuff! When Do We Want It? Now! Following up earlier post on student protest lessons in the UK, the Chronicle has a good story about the modest demands made by students at the University of California. A series of student protests at the University of California last month centered on repealing a 32-percent increase in tuition. But for some, tuition was just the beginning. 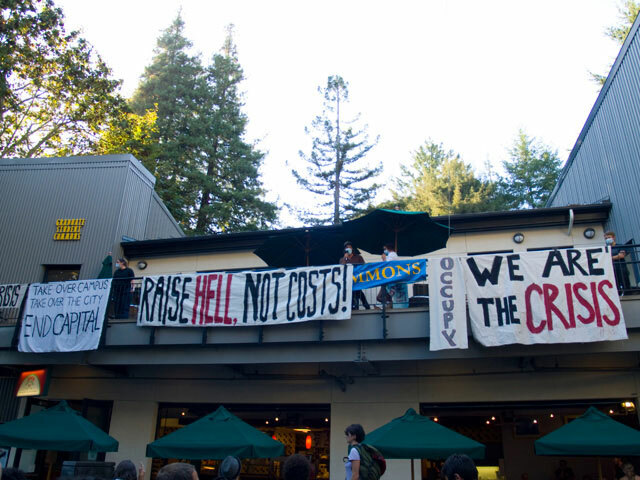 As demonstrators at the Santa Cruz campus staged a multiday occupation of an administration building, they issued a 35-point laundry list of demands. Many of those items went far beyond the scope of the tuition increase and, for that matter, the authority of university administrators. Among the demands: Stop all campus construction, impeach the university system’s president and abolish its governing board, permanently disarm campus police, keep the campus child-care center open, and forgive all student debts. The biggest news here though should have been that the anarchists were prepared to work with anyone. The Chronicle notes though that this potentially revolutionary advance was stopped in its tracks: “The protest, like those on other campuses, ended without any significant concessions being granted.” Must have been those Democrats. Splitters. via What Do We Want? Lots of Stuff! When Do We Want It? Now! – Student Affairs – The Chronicle of Higher Education. This entry was posted in Education, fees, HE, international, Students, University and tagged Chronicle, democrats, demonstration, fees, HE, international, student occupation, Students, University of California by Paul. Bookmark the permalink.